By Unknown - Illustration from Peregrinationes" from Théodore de Bry, 1603 (copy in Boston Public Library). Wikimedia Commons. Above is an excerpt from the edict issued by Francisco de Tello de Guzmán, Governor of the Philippines in 1600, authorising Oidor (Judge) Antonio de Morga to attend to the fitting and equipping of Spanish vessels to counter the presence of “hostile” ships. The supposed hostile ships were not even English. The Dutch had won independence from Spain by way of a revolution just two decades earlier and established the Republic of the Seven United Netherlands.5 By the time the Mauritius and the Eendracht arrived in the Philippines, the Dutch were still at war with Spain. Therefore, they were not welcome at all as far as the Spanish colonial government was concerned. The two Dutch ships were spotted at sunrise on the 14th of December anchored off Fortune Island just off Nasugbu. The San Diego fired at the Mauritius, came alongside it and for six hours the Spaniards and the Dutch engaged in fierce hand-to-hand combat. In the afternoon, the San Diego was found to be leaking, likely from one of the cannonballs it took from the Mauritius. A true warship could probably have taken these shots and fared better; but then again, the San Diego was in reality a merchant ship not designed for sea battles or to take cannon shots. There was also the other matter of the ship still being heavily laden with cargo, the cannons stripped from the forts in Manila and the fighting men who had gone on board. 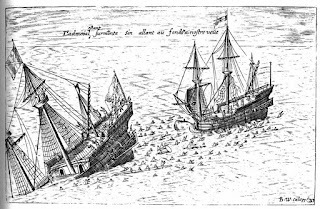 When a fire broke out on the Mauritius, de Morga ordered the moorings which connected the San Diego to the Mauritius to be released. 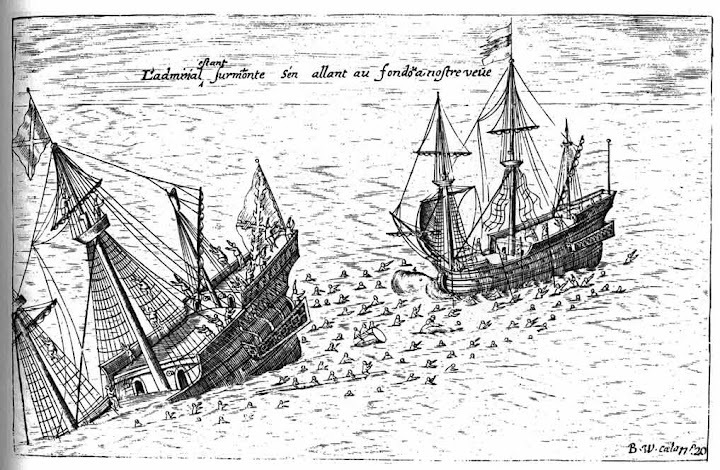 Van Noort and his crew, meanwhile, were able to put out the fire on the Mauritius; and because the Spaniards made no attempts to pursue them, were able to sail back to Holland. While van Noort’s cargo upon his return home was paltry compared to all the trouble he took, History nonetheless recognises him as the first Dutchman to circumnavigate the globe. In 1992, four centuries after its sinking, the French underwater archaeologist Franck Goddio found the site off Fortune Island where the San Diego came to rest. Among the thousands of artefacts that were recovered were Mexican coins, Japanese swords, Chinese porcelain and Portuguese cannons. 1 The patache and galliot were both light sailing vessels.